This disclosure statement explains my relationship (that of Best-Interview-Strategies.com) to my advertisers and how I receive compensation. 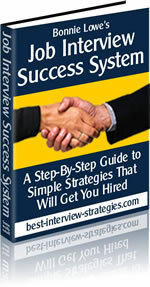 Best-Interview-Strategies.com is an informational website provided as a service to my readers. I write most of the content for the site without compensation. I occasionally engage writers to assist in the preparation of content. However, I receive compensation on a fee-for-services basis for consulting, resume writing services, and the sale of the ebooks that I advertise on this website. I also sell several of my own products and the products of some of affiliates through Clickbank and Commission Junction. Affiliate or Pay-Per-Click Advertising. I may receive a small commission when you click a link - or - follow a link or banner ad then purchase a product from the merchant. These commissions help defray the operating costs of this website so I can continue to provide information free-of-charge to you. I use Solo Build It! to build and maintain Best-Interview-Strategies.com. I love Solo Build It!, so you may see Solo Build It! banners on various pages of my site. I cannot recommend this program highly enough (it's so much more than a web host). Note: I am not affiliated with or an employee of any software companies, including Microsoft. I use various software packages in the development and operation of this site. However, I do not receive compensation of any kind from software manufacturers for the contents of this website, nor do I ever anticipate receiving compensation from them. I do not write reviews for the purpose of receiving payment. Occasionally, I receive free products to test. Sometimes, I purchase products to test. If I like the product, I may choose to write a review for the benefit of my readers. If I receive a product for free and write a review about it, I disclose that I received the product for free on the page where I have the review. I may also join the manufacturer's affiliate program and offer the product for sale along with the review, in which case the affiliate links are marked as advertising.